The Atik 420 CCD camera is the perfect choice for those looking for a camera with a good size sensor (diagonal 8.9mm), high resolution (1620x1220 pixels) and Peltier cell cooling, all at a great price! This camera also offers a compact body and low power consumption (only 1A). It is therefore perfect for telescopes medium-to-low focal lenght (eg apo refractor with a focal length lower than 700mm), but also for those who want an instrument not too expensive to create an easily transportable setup. 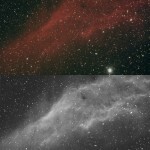 The monochrome sensor ensures a higher sensitivity than the color one and thus enables the use of conventional narrowband nebular filters to eliminate light pollution and enhance image contrast. The Atik 420 is the first camera in its class to offer high performance regulated cooling, low power consumption and narrow body all in one. It is particularly well matched with the 6 and 8 inch HyperStar systems, where the narrow body and low heat dissipation make a difference, or with short focal lenght refractors, providing a very fast, high definition wide field of view. And without the price tag. The Atik 4-Series cameras are a development of the 3-Series cameras, featuring a narrower body. These are particularly suitable if the camera is to be placed in front of the telescope in HyperStar or Fastar systems, as well as on custom-designed systems that need a narrow-bodied CCD camera. The cameras feature setpoint cooling to make taking matching dark frames a snap, and simple 12V power requirement to facilitate field operation. System requirements: Pentium III PC with 128MB RAM, XP/Vista/Win7/Win8 (not RT), CD-ROM drive and USB 2.0 port.